Trip completed. Check. Plants survived. Check. Didn’t kill each other. Check. Tried the local beer immediately upon arrival. You betcha. So, yes, the pants are a little tighter than when we began this little odyssey. But that didn’t stop us from waddling down the street to the neighborhood restaurant the first night in town. 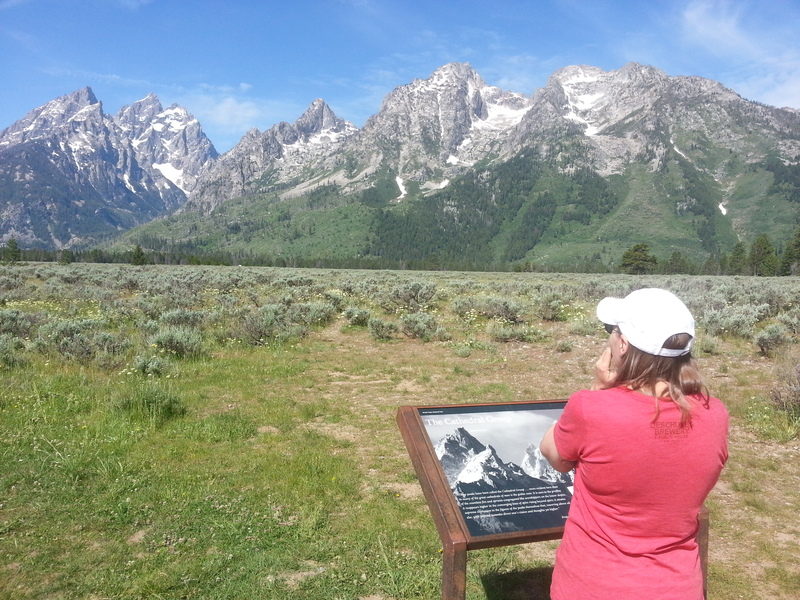 It took serious searching, but we found some breweries in the Grand Tetons. proceeded to inform us that the evening’s special was a basket of 20 spicy buffalo wings (aside: calling chicken wings buffalo wings is dumb because everyone knows buffalos can’t fly) and a pitcher of beer. The best thing is, our waitron was exactly correct. We’ve been drinking from different pages for 15 years now, and expect to until one of us drops dead. As I’ve said numerous times, we’re like left hand / right hand. Each one works well independently, but both work better together. Why should we expect our beer drinking, and burger eating, to be any different? I like malty and sweet, she likes hoppy and bitter. I like ground beef medium rare, she likes chicken sandwiches marinated in teriyaki. Yet somehow it works, and is probably how we survived 10 days in constant company with one another trapped in a Mini Cooper and surrounded by plants. I did get a break from IPA-lapping traveling companion the two times I went to baseball games. Or, a more accurate way to say it, she got a break from me. But we all made it to Bozeman, Montana in one piece – people, plants, and Mini included. Not sure I’ll be able to say the same for the furniture, which is, according to the moving company, still in Virginia. There’s nothing quite like sitting at a brewery and enjoying the mountains that are less than 30 minutes away. Upon arrival, we did try a few new beers. She has sampled two IPAs, the Deschutes Pinedrops and the Horse Thief from Sheriff Harry Plummer’s Outlaw Brewing. 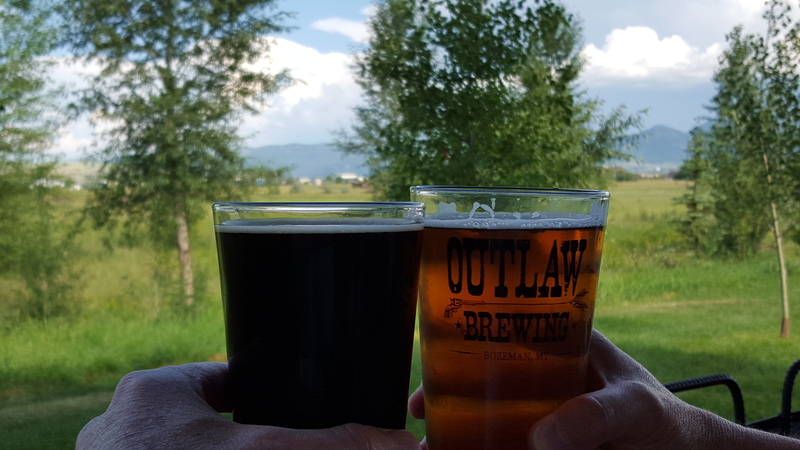 I, on the other hand, have enjoyed the Madison River Oatmeal Stout and Outlaw’s Pugilist Chocolate Porter. At the same time, we’re taking in the dry air and cool nights, along with the 360-degree view of mountains. And even though we know we’re in for a long, cold winter, there’s something comforting knowing that a town of just under 40,000 residents has four local breweries, and perhaps up to three more on the way. Perfect fodder for plenty of posts by the entire staff at Beer-and-Burgers.com. You can definitely count on more to come. Hopefully you’ll enjoy them all, no matter which page you are drinking from. 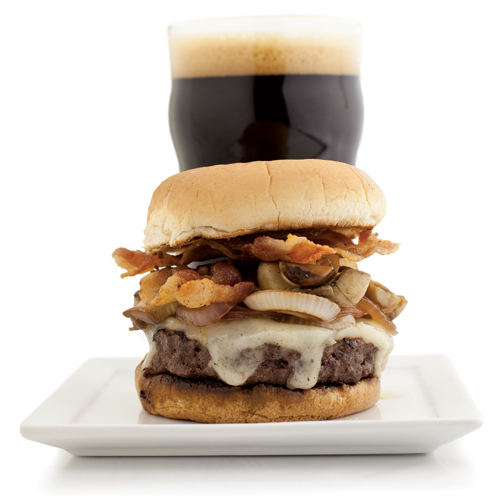 This entry was posted in Beer related, Burger related and tagged beer, burger, burgers, craft beer, craft breweries. What’s a Few Billionth Among Friends? Or 10−9 if you prefer. You probably know it best as 0.000000001. It’s obvious I’m talking about a nano. And it appears that in addition to the length your fingernail grows in one second (that’s actually a nanometer), it’s also a size of a brewery. But just like everything else nano — nanometers, nanotechnology, nano nano — you must look extra carefully to find it. Thai Me Up in a restaurant in downtown Jackson, WY. 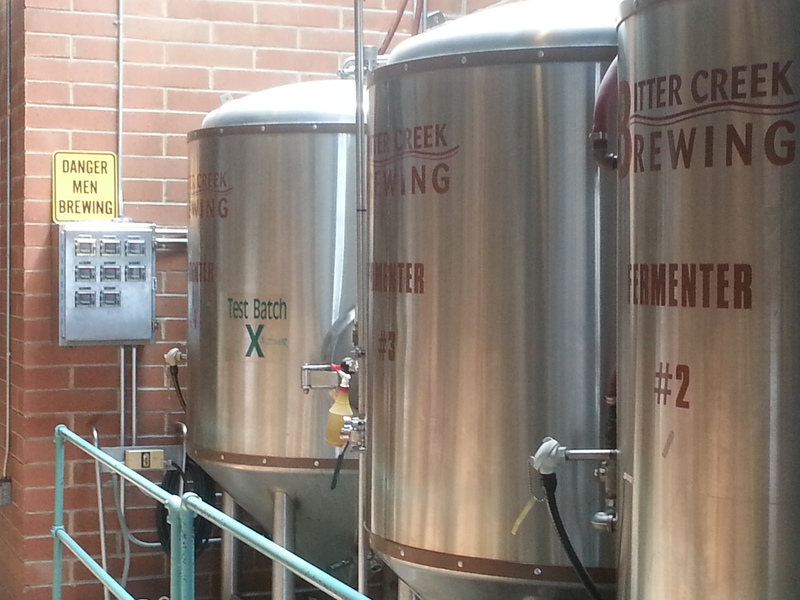 It also is the front to a nanobrewery called Melvin Brewing Co. that makes outstanding craft beer. Two flights from Melvin featuring IPAs in the front, and Stouts/Porters in the back. So what classifies it as a nanobrewery? I don’t know exactly, but it must do with the amount beer brewed (probably barrels) in a certain period of time (probably a year). According to the U.S. government’s Department of the Treasury, a nanobrewery is a “very small brewery operation” that produces beer for sale. Oh really? That means you likely won’t find Melvin Brewing’s beers in any other place than this Thai restaurant in Wyoming. But it’s definitely worth searching for. When we stopped by, Melvin had 18 different beers on tap. Being a nanobrewery, though, it doesn’t take much for one of the flavors to disappear. But with so many options available, even if they kick a keg or two, there’s still an excellent chance that something will be on tap that you will enjoy. For my IPA slurping road buddy, three of those hopped-up delicacies were there for the taking, as was a couple of pale ales. With my penchant for porters and stouts, I found plenty of each on the list to satisfy my malt tooth. How good are the IPAs? Well, the 2×4 is a Gold Medal Winner at a really impressive craft beer competition. I can’t remember now which one. But trust me, it was impressive. This double IPA is everything a DIPA should be. Which means a nice balance of malt to counteract the extensive amount of hops. Unfortunately for my hop head, that’s too much malt for her bitter-beer preferring palate. The Einstein Pale Ale was, well, a pale ale. That is to say it wasn’t hoppy enough for her. That left the two “real” IPAs in the middle of her tasting row. As it turned out, one was excellent, while the other was “unfinishable” (her word). So if you have the opportunity to choose between the GCM or the Hubert, go with the latter. While the GCM had all the standard IPA requirements, it contained an additional flavor that she described as a combination of grapefruit and Listerine. The Hubert, on the other had, was the perfect IPA in every way. Smooth at the start, bitter at the finish, and checking in at just 6% ABV and 35 IBUs. This is the award-winner of the future. On my side were the Bis Spaterator Dopplebock, the Charlie Murphy (Nitro) Porter, the EZE Imperial Porter, and a Coffee Ruckus Imperial Stout. I saved the Imperials for last and started with the Dopplebock, which our waitron said was her favorite beer of all Melvin’s efforts. I heartily agree with her assessment. The Bis Spaterator is packed with malty goodness with hints of caramel throughout the taste. A winner. The Charlie Murphy did nothing for me. For a porter, it was rather thin. And it didn’t have much in the way of any sweet flavor that I expect in such a brew. On to the Imperials. 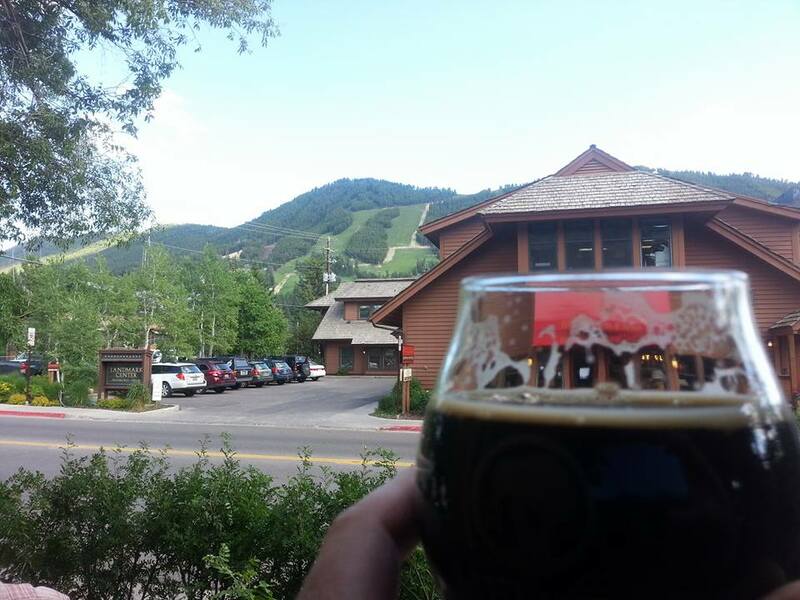 I rather enjoy drinking a quality porter like the EZE while looking at the mountains. The EZE — a beer named after me — was the exact opposite of the Charlie Murphy. Full of semi-sweet chocolate and hazelnut flavors that don’t overpower as to detract from the beer, it packs a punch at 11.2% ABV. Same with the Coffee Ruckus. It checks in at 13%. But the difference is the Ruckus is all about amplifying the flavor. After dinner, the Ruckus might be a good choice for the non-coffee drinker who wants an alcoholic coffee. It also contains the chocolate flavor that its brother the EZE has, but again, the Ruckus makes it loud and proud. Not tonight. So I ordered a glass of the EZE, and my IPA navigator settled in for a pint of the Hubert. Excellence abounded. Next time you’re in and around Yellowstone National Park, take a side trip to Jackson Hole and search for the nanobrewery behind Thai Me Up known as Melvin Brewing Co. You will be rewarded for your effort. And in the future it might be easier to find Melvin. I hear he might be getting a field promotion to microbrewery. 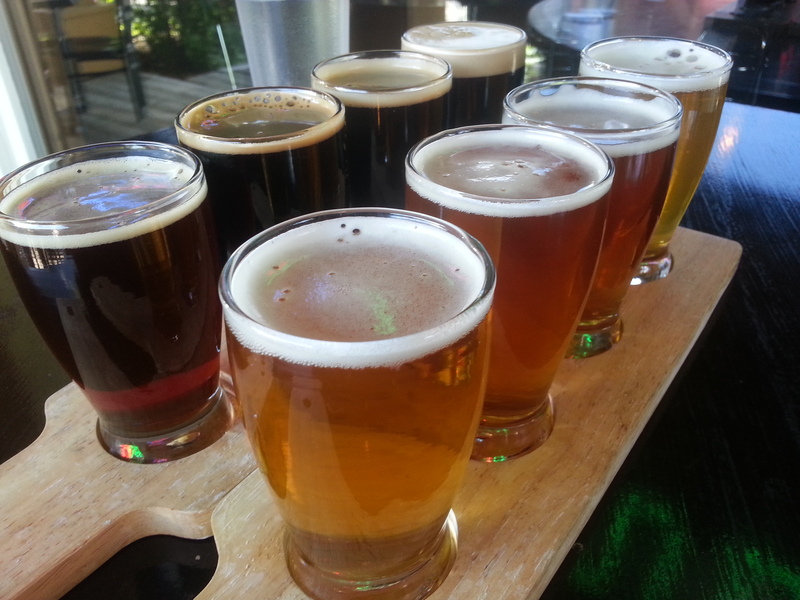 This entry was posted in Beer related and tagged beer, craft beer, craft breweries, on tap. When U.S. goalie Jim Craig beat the Soviet Union in the 1980 Olympics, he simplified the game by breaking it into five-minute increments. Once the United States had the lead, he simply shut out the Russians for five minutes. Then he did it again for another five minutes. And then another, and another. The result was a 4-3 miracle win over the Red Menace, and an eventual gold medal for the United States. Driving more than 2,000 miles across the country in a 10-day period, I also attack it in increments. Five minutes probably is a little short, though. So I count the time between breweries. And that, my friends, is the saving grace in the drive across Wyoming from Laramie to Jackson. The sign next to the tanks at Bitter Creek Brewing make it very clear that important work is being done. Total time in the car is about six hours — the max I can take in one day. But three hours in, after passing monotonous miles of scrub brush and dry dirt, the town of Rock Springs delivers a gem. OK, to be honest, Rock Springs is a dump. But if you ever find yourself there, instead of turning north on US-191 toward the beautiful mountains of Jackson, go just two miles south of I-80 and find Bitter Creek. You won’t be disappointed. Their stout, which they call A Beer Named Bob, is one of the best-tasting beers I’ve had all trip. And remember, that’s been eight days and 2,000 miles so far. I’ve tried my share of beer. The Bob, as they have nicknamed it, is an incredibly smooth, velvety tasting stout with some smokiness and creaminess combined. No one flavor overpowered this complex beer, but multiple flavors danced around my mouth with every sip. This easy-drinking stout is Bitter Creek’s signature brew, and it only takes a few sips to understand why. The Bob is definitely in the running for “Best in Beer” award from the coveted Beer-and-Burgers blog. With half of the drive completed, and two Bob’s under my belt, the next step to surviving a long day in the car is to cut the remaining time in half with a stop at another brewery. Fortunately, Wind River Brewing Co. complied with our wishes. 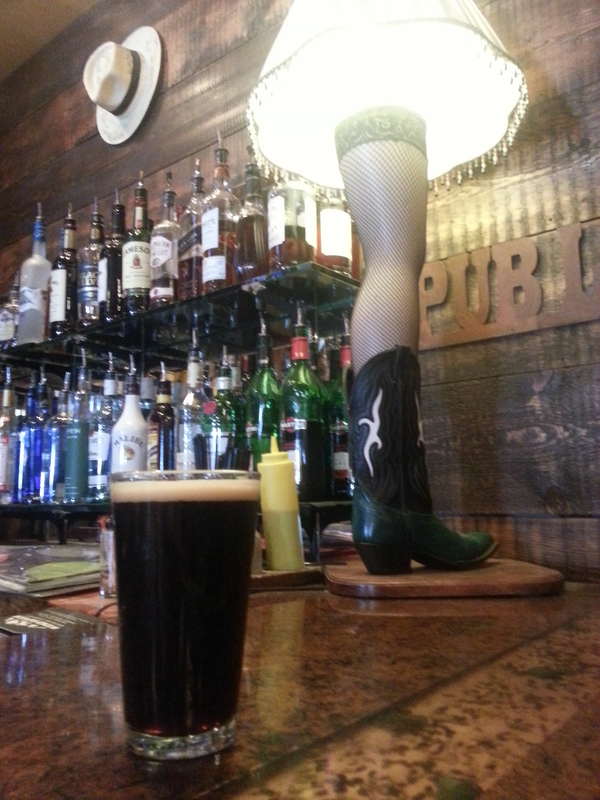 The award-winning Oatmeal Stout at Wind River Brewing Co. is almost as alluring as the cowboy version of the leg lamp. Located in sprawling Pinedale, WY, Wind River Brewing sports nine different award-winning beers. The most decorated of these is the Oatmeal Stout, a gold medal winner (just like Jim Craig) in 2006 at the World Beer Cup, and more recently a gold medal winner (like Jim Craig) in the 2012 North American Beer Awards. It must be good. In fact, it was. This full-bodied beer had hints of dry-roasted coffee thickness that makes it a classic stout. No wonder it won so many awards. With so many homemade beers, I was forced (yes, forced) to try the award-winning English Porter. Not much head on this beer, but flavors of toffee and nuts made it a nice craft beer. Wind River also has a well-regarded IPA that my hop-crazed traveling buddy was ready to try. But alas, the last keg had been kicked. So she settled for the equally interesting Wyoming Pale Ale — yes, they call it a WPA — to appease her hoppy palate. She found it nicely bitter with enough malt to add just enough balance to make the beer quite drinkable. But not with the hop-bite of the IPAs she prefers to guzzle. Good to know that in a pinch, however, a WPA may be able to substitute for an IPA. Between the two stouts I tried on the day, the better one is definitely the Bob from Bitter Creek. But kudos to Wind River for helping me survive yet another six-hour day in the car. I just wish Nebraska could take a hint from Wyoming on how to break up a long-day’s drive. This entry was posted in Beer related and tagged beer, craft beer, craft breweries. Few burgers have challenged the supremacy of The Idiot Burger in Lexington, KY, since the start of this cross-country odyssey began more than a week ago. But now, we have a new contender for the coveted Beer-and-Burgers.com “Best in Burger” award. Say hello to the Nacho-Cheese Burger at the Library Sports Grille & Brewery in Laramie, Wyoming. The Library Grille (don’t forget the “e” at the end) is a family friendly sports bar in the downtown area, just a mile from the University of Wyoming campus. But hey, it’s Laramie. Everything is within a mile of campus. Honest, mom, I’m at the Library. 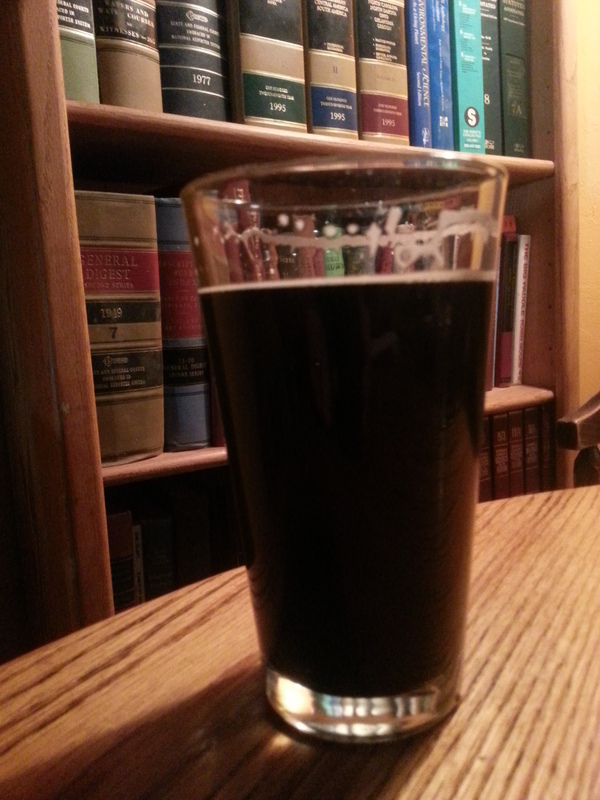 Here I am studying the Steamboat Oats & Cream Stout. The Nacho-Cheese Burger is just like the Cowboy Burger, of course, which means it’s the traditional burger with lettuce, tomato, onion and pickle. Except that the Library Gille (don’t forget the “e”) throws jalapenos, bacon, and cheddar cheese on top. Delicioso. Most importantly, the chefs at Library Grille (don’t forget the “e”) know how to cook a burger. When you ask for it medium rare, you get it medium rare. It has been amazingly difficult on this trip to get a burger cooked with enough pink in the middle that there’s still some moisture and flavor left in the meat. One restaurant we tried had an extensive list of tantalizing burger options. But when I ordered the Samba Burger and asked for it medium rare, the barkeep informed me that “all our burgers are cooked well done.” Oh good. I like my burgers burnt and tasteless. Yum. Looks like a turkey sandwich for me. But the Library Grille (don’t forget the “e” at the end) made it right. And the chefs were also generous with the amount of jalapenos. Nothing worse than asking for the “jalapeno burger” and getting something with only one or two slices of that pesky pepper. If the burger wasn’t enough, the Library Grille (don’t forget the “e”) is also a brewery, and had several of their locally made options on tap. I enjoyed the Steamboat Oats and Cream Stout, which was full of body and creaminess, as its name implies. It also had a touch of chocolate and roasted hazelnuts in the taste. Nicely done. Finally, the cool thing for the students who attend the University of Wyoming is that when they go to the Library Grille (don’t forget the “e” at the end) they can tell their folks they spent the evening at the library, and they won’t be lying. I’m not lying when I say the Nacho-Cheese Burger is giving The Idiot Burger a challenge for Best in Burger. And with just a few more days until we reach Bozeman, Montana, it may boil down to a two-burger race. This entry was posted in Burger related and tagged burger, burger place, burger places, burgers, craft breweries. In Beervana, there’s a brewery on every corner of every street in every town. I think Fort Collins is trying to make Beervana a reality. As we made our way north from Denver on Sunday afternoon, we still weren’t sure whether to visit New Belgium Brewery or Odell Brewing Co. But once we got closer to Fort Collins, the choice was obvious — first one, then the other. Since we’d tried, and enjoyed, numerous New Belgium beers in the past, our plan was to visit Odell Brewing first and see what was available to taste. If we found some beers we really liked and knew we couldn’t get elsewhere, we would stay. Otherwise, we’d head over to NBB to taste what they had on tap. No one told us that we’d have to pass two more breweries just to get to Odell. And that we’d pass those two again on our way to New Belgium. 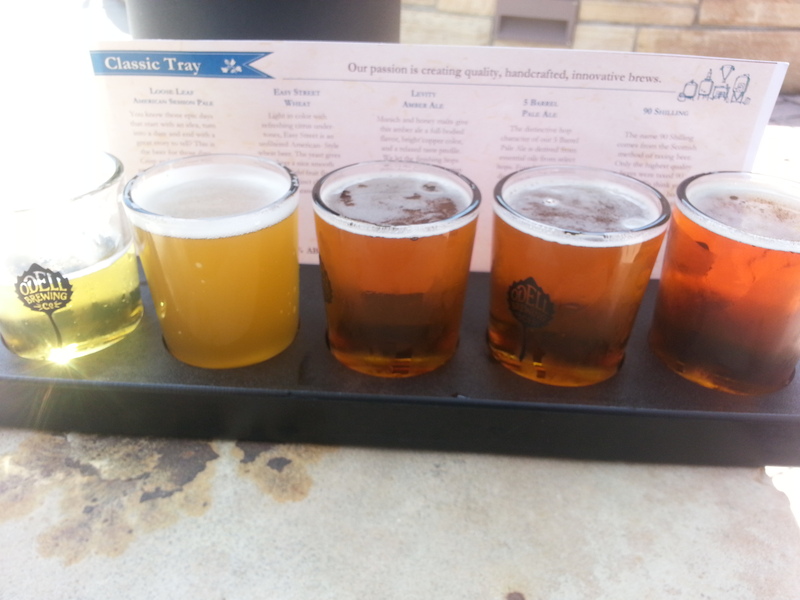 The Classic Tray at Odell Brewing was mostly pale ales. The first brewery we saw as we neared our destination was Fort Collins Brewery. We couldn’t stop, though, because we had a preliminary visual on the Odell taproom, and we were on a mission. The taproom at Odell’s was hoppin’ with lots of people getting flights. They had three options from which to choose that seemed rather randomly compiled. For example, a flight with the only malty beverage on tap also featured two IPAs. So I went with a single pour of the Cutthroat Porter (they had a pilot nitro version of the porter, but I stayed traditional), while my IPA slurping traveling companion chose the Classic Tray, which included the Loose Leaf American Pale Ale, Easy Street Wheat, Levity Amber Ale, 5 Barrel Pale Ale, and the 90 Shilling Ale. The Cutthroat hints of chocolate and cocoa, sits up nicely in the glass, and is smooth going down. In hindsight (which mine is 20/15) I should have tried the nitro version also. Meanwhile, the IPAer preferred the 5 Barrel Pale Ale among the choices she was given. No surprise there, since Odell puts one batch of hops in the fermenter, and add four more batches of hops in the boil. Even though the patio at Odell Brewing was spectacular — tables with umbrellas, trellises covered with vines and flower pots, stone walls for seating, and lots of dogs — none of the beers really knocked our socks off, so we headed toward New Belgium. To do so, we had to drive back past Fort Collins Brewery and turn the corner … where we immediately saw Snowbank Brewing. No time to stop, though, because not only did we have New Belgium in our sights, but we still had to make it to make it all the way to Wyoming by sundown. 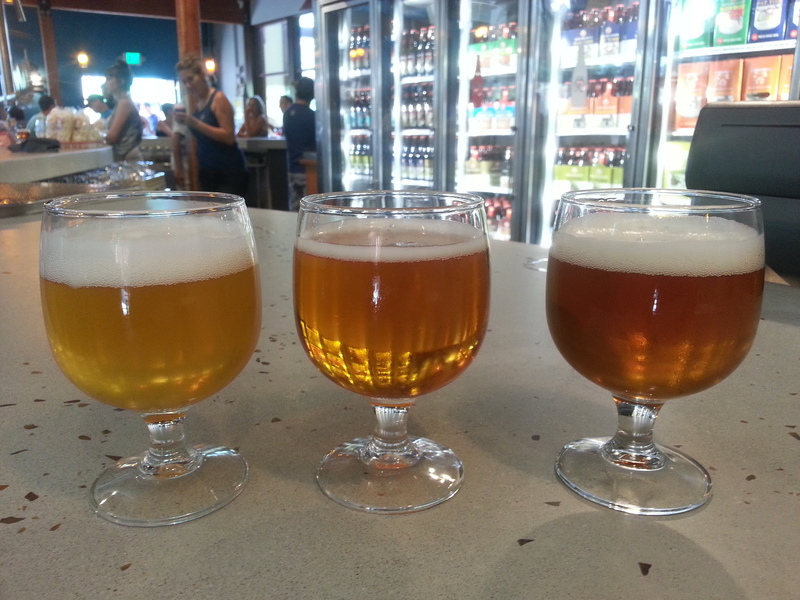 Tasting the IPAs on tap at New Belgium. New Belgium Brewery was on the third corner in this block as Fort Collins attempts Beervana. The taproom and patio area were much smaller than Odell’s, but it seemed all about the beer here. Because it’s summer, there’s usually not many options for brews in my sweet spot — porters and stouts. New Belgium had just one, the Cocoa Mole, which I was first introduced to several months ago by D.J. at Cap Ale. Thanks, D.J. This tasty beverage is a porter with spice, as in spicy, not holiday. When you drink it, you get a spicy kick at the end of the taste. As interesting as it is delicious. For the hop chugger, three different IPAs were on tap, so she sampled them all. Collusion Cacao IPA, the Hop Tart, and the Liquid Center Surprise. The Hop Tart was too sour for either of our tastes, but was surprisingly better when it followed a sip of the Cocoa Mole. The other two IPAs were delicious, she reports. That is all. Getting a tour of New Belgium is next to impossible (check out their tour schedule calendar if you don’t believe me). So we took the self-guided tour, which included the bicycle gear crank for a pen holder, and bicycle rims for bathroom mirrors. Great branding. And now, off to Laramie for our first venture ever into Wyoming. Two days in Denver, and haven’t even scratched the surface of trying all the craft beer available within walking distance of our hotel. So here’s a day-by-day rundown of our efforts to sample them all. Arrive in town late in the day and in desperate need of something to erase the endless hours of travel across Nebraska. So we headed to Wynkoop Brewery for a beer (or two) and a burger.Wynkoop is one of the first breweries to open in Denver, so they’ve had lots of practice making quality craft beer. 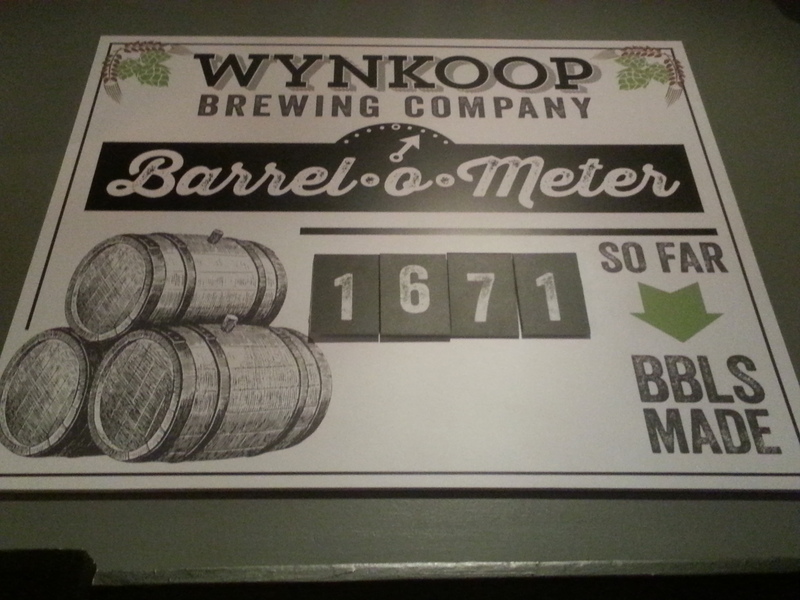 The first brew pub in Denver, Wynkoop has made its share of beer. In fact, the Barrel-o-Meter sign on the wall says they’ve made almost 1,700 barrels of beer, and a bartender named Al said that sign what in desperate need of updating. I started with the Cowtown Milk Stout, a nitro-infused traditional stout with a thick head and a semi-sweet taste. My IPA swilling road pal sipped on a Belgorado Belgian-IPA, a combination of Colorado-grown malt and lots of Belgian yeast. But at only 48 IBUs, it didn’t quit hit her bitter spot. Mine, on the other hand, was quite easy to drink, and I was therefore encouraged to try another local malty brew — the Real Big Stout. This Imperial effort, made in conjunction with Ska Brewing Co., was chocolaty with lots of caramel flavor. And at 10% ABV, they weren’t foolin’ around. It was quite tasty. So was the burger I had, though I wish it was more pink in the middle. Seems to be a challenge to get a real medium-rare burger in these parts. Met some relatives for lunch and headed to the Mellow Mushroom, a touristy pizza joint but with good beer options, as most restaurants in Denver seem to have. There our beer-loving waitron, Kate, had fun letting us try numerous options from the bar. Ultimately, I enjoyed the New Belgium Portage Porter, which I’ve tasted from the bottle before, but not from the tap. It was, as are most New Belgium products, nicely done. This porter has a malty feel but isn’t overly sweetened. I convinced one of the fam to try the Yeti Imperial Stout from Great Divide Brewing Co., which has an outpost just a few blocks away. He liked it, and who wouldn’t. This multi-award winning brew is coffee meets toffee. As he was sipping his 9.5% ABV beverage, I ordered the Boulder Shake. Again, I’ve had this previously. But this was a nitro version, and it went down smooth as … well … something that goes down smooth. Meanwhile, my hop-loving friend was at the other end of the table sampling numerousIPAs, thanks to Kate. No clue what she ended up drinking. Enjoying the 90 Shilling Ale while watching the Rockies and Brewers. In the afternoon, it was off to another ballpark. This time, Coors Field. Fortunately, Coors is not the only beer available in the stadium. I was able to enjoy a 90 Shilling Ale from Odell Brewing Co., another Colorado-based craft brewery. There were several other options for the crafty beer drinker, but none that really hit my malty sweet spot. So the 90 Shilling, with its combination of Scotch ale malt and Amber ale ruddiness, was perfect for a warm summer day at the ballpark. Breckenridge beckoned, so we complied and went to Breckenridge Colorado Craft, a taproom one block from the stadium featuring, as one would expect, mostly Breckenridge Brewing Co. beers, and a few others as well. But why wander off the trail? So I enjoyed their Oatmeal Stout while the hop-head had the Fresh Hop Pale Ale followed by the Breck IPA. And, of course, I had to have the NVP — Nitro Vanilla Porter. The non-nitro bottle version of this beer has been a staple in my fridge for years. Having it on tap, in Denver, infused with nitro, made for a perfect ending to a beer-filled day. Next stop, Fort Collins. The only question is whether to stop at the New Belgium brewery, or the Odell brewery. Or both? This entry was posted in Beer related, Burger related and tagged beer, burger places, burgers, craft beer, craft breweries. Two people have been banned from baseball for life — Pete Rose and my IPA swilling road buddy. The difference is while the former is not happy about his fate, the latter did so willingly, with joy, and gratitude. So off to the College World Series I went, alone. Willingly. With joy. And gratitude. It has been a lifelong dream to come to the CWS. Of course, that dream always included my alma mater, the University of Texas, playing in the series. So my dream didn’t exactly come true, but here I was, in Omaha, at the College World Series. Who cares who was playing. 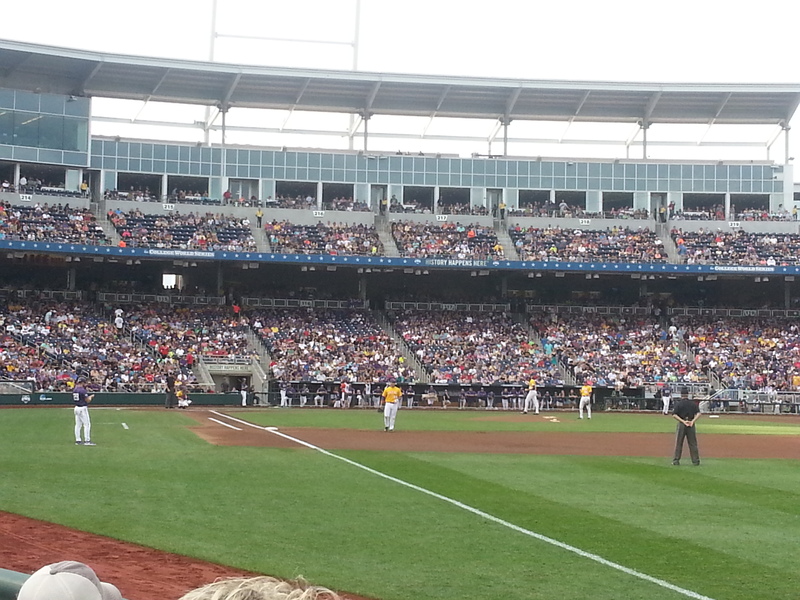 My view from right field at the College World Series. 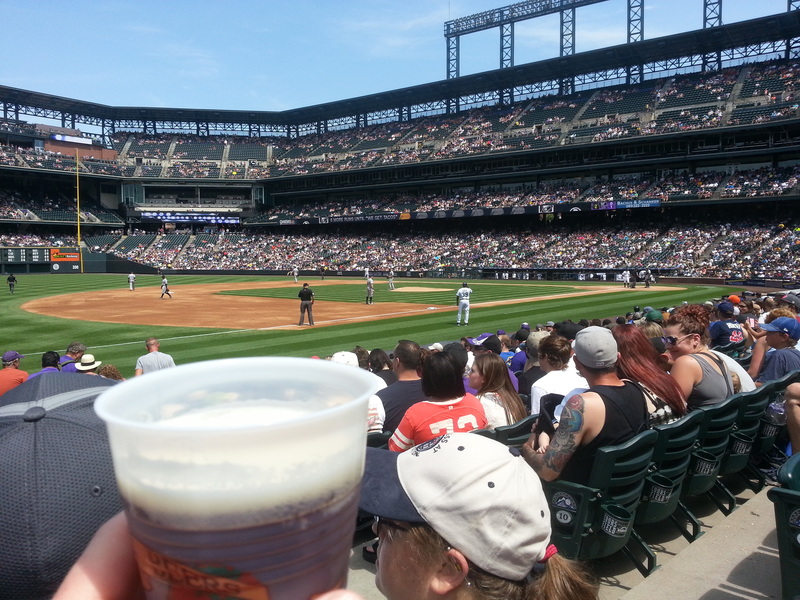 Finding good beer at a baseball game is typically a challenge. And since this was an NCAA sanctioned event, there was no beer in the stadium. However, there was plenty of it to be found in “tent city” just across the street. In fact, if you can make your way past all the vendors selling the same CWS swag in every tent, you find The Old Mattress Factory, which is (wait for it) an old mattress factory that has been converted into a bar and restaurant. There I was able to enjoy a couple of beers before the game. While I’ve tasted several offerings from Founders Brewing Co. — the Porter, the Nitro Oatmeal Stout, the Breakfast Stout (my favorite), the Imperial Stout, and the KBS — I hadn’t ever seen the Scotch Ale before, which the Mattress Factory had on tap. It was a typical Founders effort, well-made with all the appropriate characteristics of the beer’s style. It checked in at about 8% ABV, so one was plenty as a starter. I followed that up with an Oatmeal Porter from Zipline Brewing Co. out of Omaha. I’d never had a porter made with oatmeal before, and this one tasted exactly as you would expect — the sweet maltiness of a porter combined with the thick woodiness of an oatmeal stout. A little bit of caramel rounded out the flavor. All-in-all, a beer I would definitely try again, and the type of porter that even my IPA chugging friend soaking in a tub back in the bed ‘n’ breakfast might enjoy. According to Zipline, the Oatmeal Porter was just a winter seasonal until an angry mob of cult followers threatened the brewers, who now make it available year round for our pleasure, and their safety. Two beers was enough tonight for I had baseball to attend … to. While there were plenty of burger options at the ballpark, I took a burger break and enjoyed a spicy Italian sausage with peppers and onions. Yum. It was a perfect evening for baseball. And even better, the team I was cheering for won. This entry was posted in Beer related and tagged beer, craft beer.